For Now, I’ve No Political Ambition –Al-Mustapha. 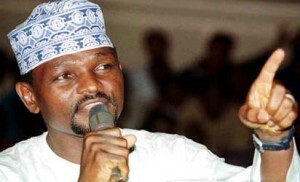 The former Chief Security Officer of late General Sani Abacha, Major Hamza Al-Mustapha has dismissed insinuations linking him politics saying for now, he is not interested in political positions but to help in fostering peace and unity in some troubled states. Al-Mustapha stated this while addressing newsmen shortly after he paid a courtesy visit to the Emir of Kano, Alhaji Ado Bayero, at his palace in Kano. His words: “I did it with a view to putting a helping hand. Right from 1984, I found it mandatory to help associations in support of peace and unity and now that God has granted me freedom, I cannot say no. “We have opened ground for reconciliation to many tribes and communities and we hope it will add colours towards achieving peace, unity and development in the country. “To us, the background we have is that of a country solidly united, where hopes and confidence of the people are fully restored and anchored upon progress and development. The world that Jesus was born into was quite violent. War was constantly in the air. The Israelites, the Jewish people who were occupied by the Romans, were talking constantly about rebelling against the most powerful and ruthless empire at that time in history. There was injustice and many hurting and broken people. Ironically, religious leaders often hurt the very people that they were supposed to help. So, Jesus enters into this world to bring peace. I wonder, now, do we live in a peaceful place now that Jesus has come? Even if there were no North Korea launching missiles, no Arab Spring, no political differences, would we, then, have peace? Do people live in peace, today, surrounded by others but still lonely, constantly living in fear, living paycheck-to-paycheck, working jobs they don’t like, with cell phones ringing and in-boxes full, living in what Thoreau called “quiet desperation”? Those things won’t change until we change. Jesus came to change human hearts because he knew that, if people had peace on the inside, there would then be peace everywhere else. This Christmas, remember that Jesus came to be our Prince of Peace. Prayer: Thank you, Lord, for filling my heart with a peace that passes understanding. Help me to be authentically peaceful and, thereby, an example of your peace to others. Amen. Devotion: How might you, through encouragement or example, bring peace to the hearts of others? Peace begins with you and peace begins with me. That’s the message that comes from the Prince of Peace, whose birth we have been celebrating. We may call upon the Prince of Peace to end the violence, to end the abuse of others, to end the wars. But Jesus says, “I want the brokenness inside of you to change. That’s where I want to start.” That’s what Jesus says to us. And there’s no point in cutting down the weeds if we don’t pull up the roots. When we read about peace in the Bible, we read that it is rooted in this word, shalom. It’s a greeting. It’s like aloha, good-bye, and hello. It means peace, but it also means welfare, and primarily wholeness. The word shalom means to be made whole, to be complete. There’s a part in the Sermon on the Mount where Jesus talks about loving your enemies who hate you, and turning the other cheek. He finishes by saying, “Be perfect as your heavenly Father is perfect.” We could interpret that to mean that there’s a list of rules that we need to follow perfectly, but what Jesus is saying is to “be shalom.” Be at peace. Be perfected in the sense of being made whole, being made new, being a new creation. Prayer: Dear Lord, pull up the roots of my fear, failures, and hopelessness. Replant me in the good soil of your love, making me whole, complete, at peace, and able to grow and flourish in your kingdom on earth. Amen. Devotion: What “roots” of negativity need to be pulled in your life so that you can live in the peace of God? There is something in my life that I treasure more than any other thing. I treasure this one thing – that God loved me before I was born. Before I was born, God was looking forward to me being born. He was excited about the fact that I was born and that I live in this world. That’s how God feels about you, too. When your mother was pregnant with you, God was thinking, “I can’t wait until this baby is born. And I can’t wait to have a personal relationship with this new life.” A proud, loving, and good Father, the Lord sees in you what nobody else can see, believes in you when nobody else believes, and loves you to an extent that cannot end. The apostle Paul tells us that our suffering turns into perseverance, and our perseverance turns to character, and our character turns to hope. That happens because the love of God, which is in Christ Jesus, is injected into our hearts by the power of the Holy Spirit. There is no greater cure to all of the ills, all the turmoil in the world around us, than the human heart being brought to a peaceful shalom place because of the love of God. Prayer: Dear Lord, thank you for loving me from the very moment I was conceived. Through your love, I feel a peace that passes all understanding. Amen. Devotion: How does God’s love for you bring you peace? I remember two years ago when we had our second baby, when my wife Hannah went into labor, we arrived at the hospital to find that all the beds were occupied. So, they put Hannah in a bed in the hall, in full labor, with nurses scurrying around. We felt uncomfortable, angry, frustrated. We wanted to be in a private, clean, nice room to give birth to our baby. I think about how uncomfortable that was – a very scary and painful experience. Then I imagine what it was like for Mary, in labor, no room at the inn. There’s nowhere for her to have this baby, which, especially in those days, was a very dangerous situation. And the best they could come up with was a stable out back. There, Mary gives birth on a bed of straw. And Jesus is laid in a manger, a feeding trough, where the horses and cows eat. To make it ready for the baby, they had to clear away all of the dirt to make it as clean as possible for the newborn. There’s Mary with all of her injuries from having just given birth to a baby, and yet do you feel, when you read that story, any of the aggravation and anger I experienced when Hannah was giving birth? You don’t see that. You see this peace. You see peace in the midst of a very difficult situation. Prayer: Father, when I read the Christmas story, every part of it is filled with your peace. No matter what the difficulty or challenge, your peace filled every heart that came close to the Savior. May my heart come close and find your peace in Jesus. Amen. Devotion: What can rob your peace…and restore your peace…at Christmastime? We stumble over the fact that God doesn’t speak or act the way we think He should. But from Isaiah we learn not to manufacture our own light when we walk in darkness. From Saul we learn not to run ahead of God when the answer is delayed. From the Gospels we learn that God’s silence does not mean we are rejected or unloved; it must be understood in the light of God’s redemptive purposes. For those who have allowed the Holy Spirit to perform His work in their lives, the “Why, God?” questions are accompanied by a growing peace and trust rather than disillusionment and unbelief. God wants us to learn to be at peace in our souls by virtue of our relationship with Him, not by virtue of the information about our circumstances that we sometimes receive from Him. People searching for God’s peace and comfort often look for it by asking God for information about their future. But He wants our peace to come first by fixing any problems in our personal relationship with Him. Father, how often I run ahead of You and question, “Why?” Teach me to be at peace with Your purposes because of the trusting relationship I have with You. of us until the very end. Karzai Pulls Last Minute Switch as Afghan Elders Back US Pact. KABUL, Afghanistan — An assembly of Afghan elders endorsed a crucial security deal on Sunday to enable U.S. troops to operate in the country beyond next year, but President Hamid Karzai left the matter up in the air by refusing to say whether he would sign it into law. The gathering, known as the Loya Jirga, had been convened by the president to debate the pact which outlines the legal terms of continued U.S. military presence in Afghanistan. It voted in favor and advised Karzai sign it promptly. But Karzai, in his final remarks to the four-day meeting, said he would not sign it until after a presidential election due next April. The president did not elaborate, but has previously said a free and fair vote is needed to guarantee peace in the country and his spokesman later said Karzai had not changed his mind. As the meeting ended, assembly chairman Sibghatullah Mojeddedi told Karzai: “If you don’t sign it, we will be disappointed.” Karzai responded “Fine!” and left the stage. Failure to clinch the deal could mean a full U.S. pullout, leaving Afghanistan to fight the Taliban insurgency on its own. U.S. troops have been in Afghanistan since leading a drive to remove the Taliban in late 2001. U.S. officials, including Secretary of State John Kerry and Defense Secretary Chuck Hagel, said the deal must be signed by year-end to begin preparations for a post-2014 presence.The Taliban condemned the endorsement of the security agreement, calling it a “pact of slavery.” The militants said in a statement the deal would benefit neither side. In his remarks, Karzai acknowledged there was little trust between him and U.S. leaders while saying signing the pact was broadly in Afghanistan’s interests. Backing from the Jirga, handpicked by his administration, had been widely expected. Most speakers were muted in their criticism of the thorniest issues in the document, including a U.S. request for immunity for its troops from Afghan law. Critics say Karzai’s recalcitrance on the date might reflect his desire to distance himself from any deal with the United States and avoid speculation that he has sold out to the West. A former U.S. ambassador to Afghanistan, Ronald Neumann, said Karzai is known to use 11th hour demands to press for concessions from the United States during negotiations. “He has to be the one . . . to sign off on this loss of Afghan sovereignty. He knows intellectually that this is in Afghanistan’s interest, but at the same time it’s distasteful to him,” Neumann said. The deal took a year to bash out and Karzai’s about face threw the entire process into doubt just hours after both sides announced they had agreed on its terms. Even in Afghanistan, where some view the security agreement with the United States with contempt, many officials were unsettled. Some believe Karzai is simply concerned that the United States and other Western countries may attempt to interfere in next year’s presidential election. Having served two terms, he is ineligible to run again. By withholding his signature until after the vote, Karzai could also use ratification as leverage to ensure the United States does not try to back a candidate not to his liking. Opposition leader Abdullah Abdullah, who dropped out of a run-off against Karzai in the 2009 elections, citing concerns about fraud, was among those who shared this suspicion. “What he is asking for is a guarantee about the elections and most probably his favorite candidate,” Abdullah told Reuters. Karzai accused the international community of meddling during the 2009 election that he won, saying they had tried to encourage Afghans to vote for an opposition candidate. Others were concerned that Karzai’s reluctance to sign the agreement could jeopardize Afghanistan’s relations with its international allies and its economic future. “If we keep talking about signing the agreement after the election, we will lose our biggest ally,” said Freshta Amini, an MP from southwestern Nimroz province. But some Loya Jirga members supported Karzai’s comment about delaying ratification. “If the Americans want to sign this pact with Afghanistan, then they should also respect our demands for a transparent election, and peace and security in the country,” said Farid Alokozai, provincial council chief in Wardak, outside Kabul. One cabinet minister close to Karzai said many members of the president’s team were unhappy with his decision.